Off late, where ever you go, there is only topic and that is how Baahubali 2 is going to be. Directed by the genius Rajamouli, the magnum opus has released in over 8000 screens all over today. Let’s see whether the film reaches our expectations or not. There are way too many things that impress you in Baahubali 2 but it is practically impossible to pen all of them down in this review. Let me start by talking about the gigantic scale of the film. It is like a never before and never again kind of scenario as Baahubali 2 is huge in every aspect. Every visual of the film is filled with surprises either in terms of graphics or the extravagant sets that have been put up. The costumes, drama showcased and performances are a first of its kind in Telugu films. A number of audiences might get disappointed with the way Rajamouli has answered why Katappa killed Baahubali. Even though, the twist gels well with the script, it might not meet the expectations of many. Once the twist is revealed, the film becomes a bit predictable. The climax looks a bit rushed upon as things happen way too quickly. Baahubali 2 is one of the most technically efficient films made in India. If part one surprised you with its scale, then second part will leave you speechless with excellent visual effects and emotions. The kingdoms shown and sets created look top notch on screen. The entire team of Makuta should be appreciated for taking the film to another level with their VFX work. On the whole, Baahubali 2 is one film which leaves you speechless. Right from the word go, it has intense drama and action as every frame in the film is a visual wonder. Be it the heroic fights or the lavish war scenes, Rajamouli showcases some never before scenes in Indian film history. This film will be remembered and spoken about for years to come and break every possible record in the country. The performances, drama and the lavish scale look jaw dropping and make this film a never before experience for every movie lover. 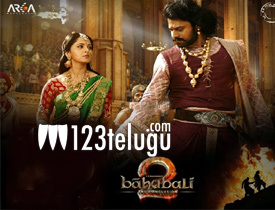 Finally, just ignore the simple story line and do yourself a favor by taking your entire family to watch this magnum opus called Baahubali as wonders like these only happen very rarely.